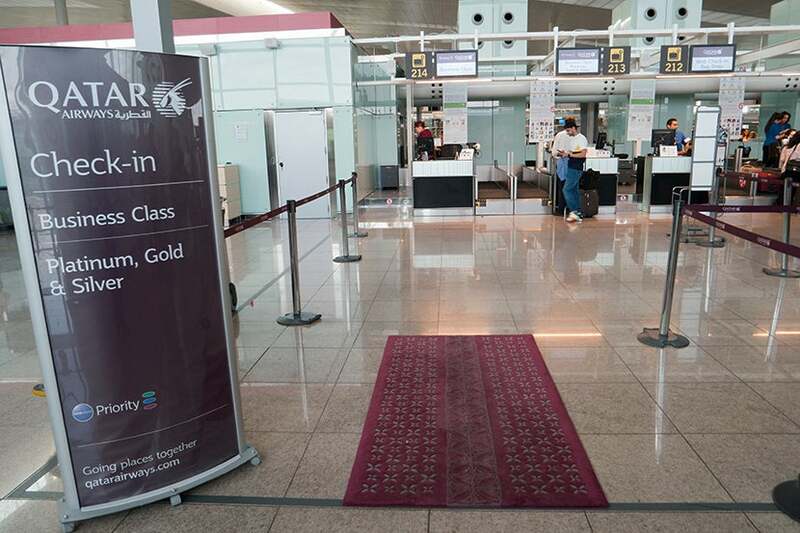 TPG Contributor Mitch Berman‘s family recently traveled from Barcelona, Spain (BCN), to Bangalore, India (BLR), via Doha, Qatar (DOH) — it was his first experience on Qatar Airways. My family and I booked the first leg of our Barcelona–Bangalore flight using American AAdvantage miles on British Airways. 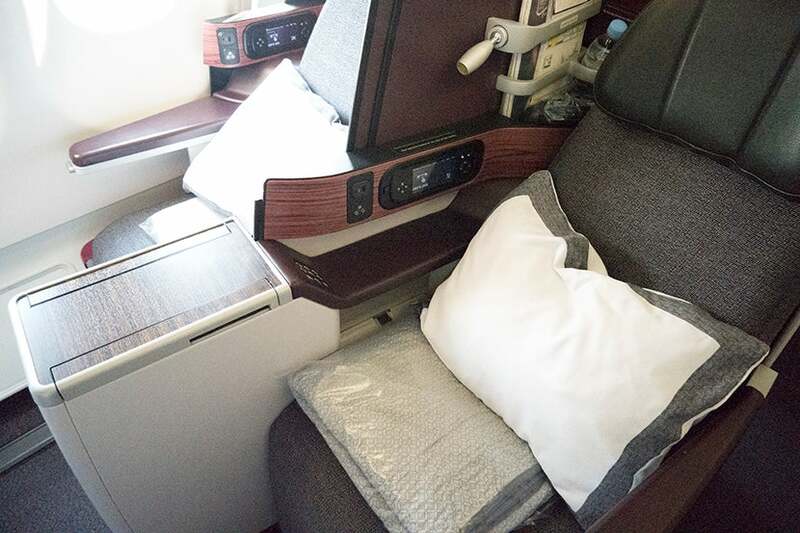 But then we decided we didn’t want a 20-hour layover in London, and an AA agent recommended we switch to another Oneworld partner, Qatar Airways, which she said was the best airline in the world. (In fact, at that time, Qatar had just “fallen” to the number-two rank on Skytrax.) Going through Doha instead of London, we also avoided Heathrow’s exorbitant fees, netting us a refund of $685 for three tickets. We used the Business Gold Rewards Card from American Express, netting us 3x Membership Rewards points (airfare purchases directly from airlines are one of the categories included.) The American Express Platinum would have earned us 5x on airfare. 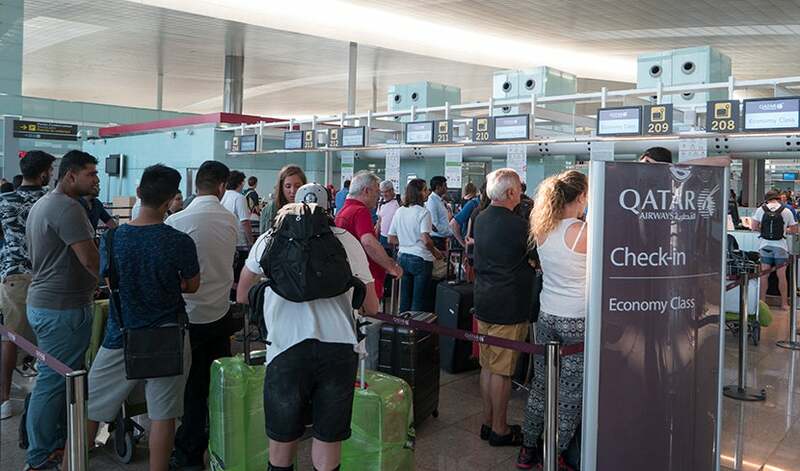 Check-in was nearly instantaneous in business class — not so in economy. Good news, yes, but followed immediately by bad news. 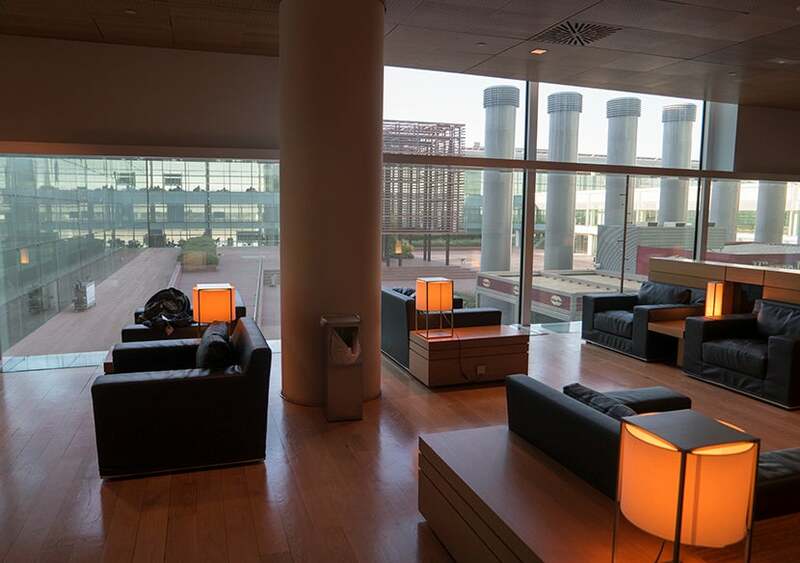 After check in and security, there was a visit to the Pau Casals lounge, which — spoiler alert — was not up to what the rest of the experience proved to be. First, we had to find the lounge. We had a bit of trouble because there’s almost no signage in El Prat airport. You could actually see the lounge, but damned if you could get to it. Certainly not on the elevator, which went only to the floors above and below the lounge. 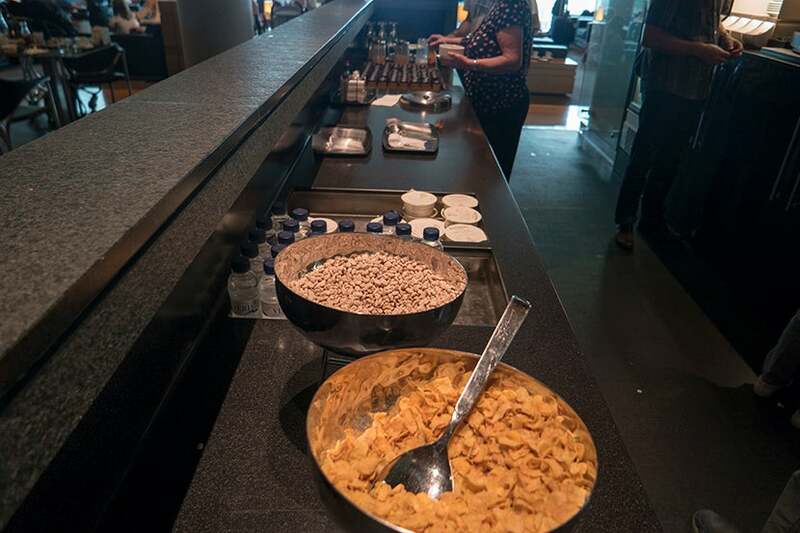 We arrived at breakfast time, rarely the best time for food, and this lounge offered almost none. It’s a perfectly nice-looking lounge, but looks can be deceiving. There were cornflakes, granola, some very bread-intensive sandwiches and a solitary yogurt. No hot anything. 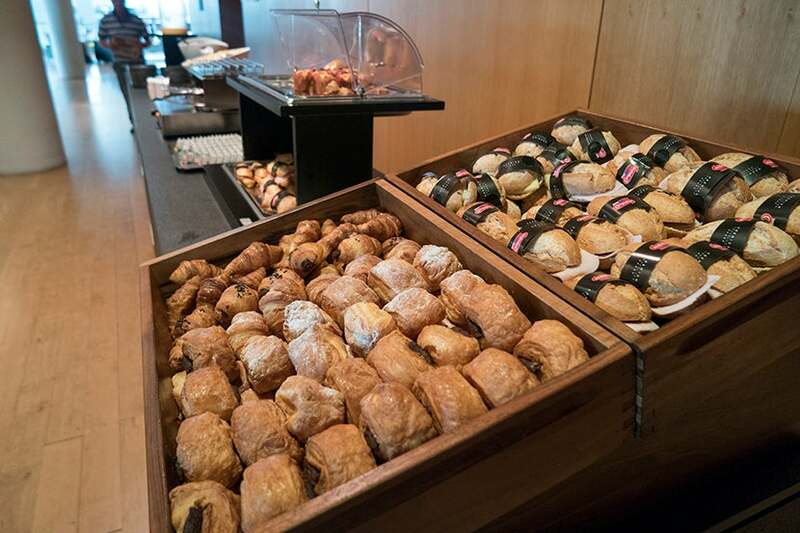 The one happy offering was the sweet, glazed, buttery puff pastries. Absolutely delicious! 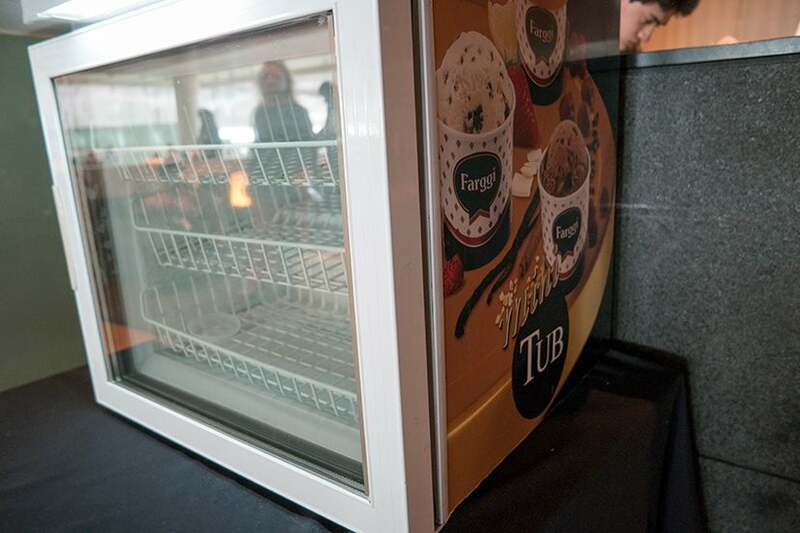 An ice cream machine was plugged in, turned on, and desolately empty. There was also an attractive “quiet room,” replete — in spite of prominent signs — with squalling child. Honey, the kid keeps screaming. I know: Let’s drag him into the quiet room! The showers were absolutely free — but the clever catch was that towels weren’t. Those cost 10 euros (~$11). Call me crazy, but I didn’t think this shower was worth 11 bucks. The Pau Casals lounge looks like a lounge, but it doesn’t act like a lounge. I’m sure poor Pau Casals is breaking a cello string in his grave. But much better things lay ahead. 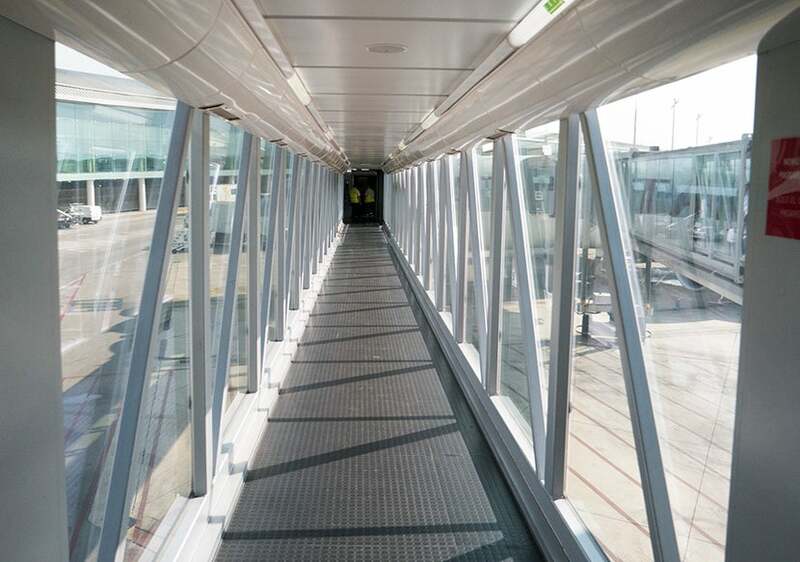 Business passengers were piped down a clear-walled jetway and welcomed to our seats with small bowls of warmed cashews, almonds and shelled pistachios and Billecart-Salmon Brut Reserve Champagne. It’s a bright, golden and very bubbly Champagne, and I found it most pleasant. And then I found it again. Many of Qatar’s A330s still have the dreaded angle-flat seats in business, as can be seen on SeatGuru. Business class on all Qatar 330s is in 2-2-2 layout without aisle access for all seats, but at least our airplane had lie-flat seats in business. 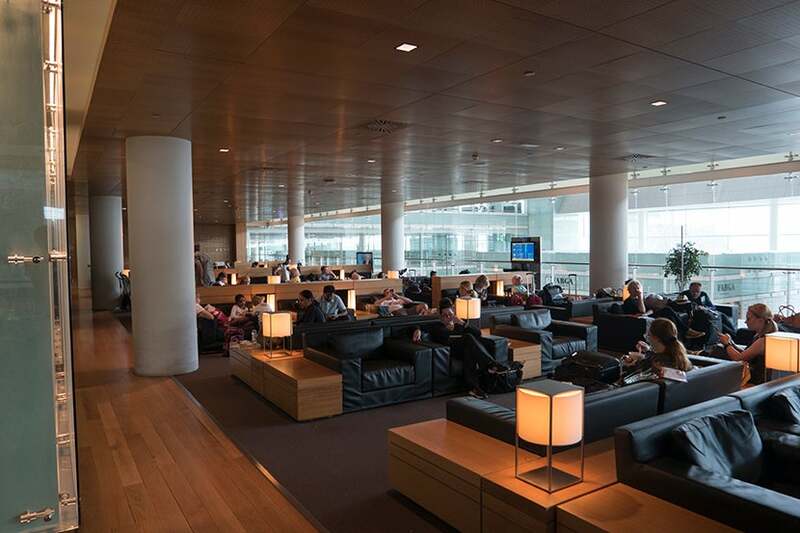 At our seats we found Evian water, a dimmable swiveling reading light and two magazines — Oryx, which every passenger on a Qatar flight gets, and Oryx Premium, only for first and business class. The cover of the premium version featured a wan Ben Affleck, looking very jetlagged. I also took a peek at the 2-4-2 economy cabin, which appeared to be relatively comfortable. 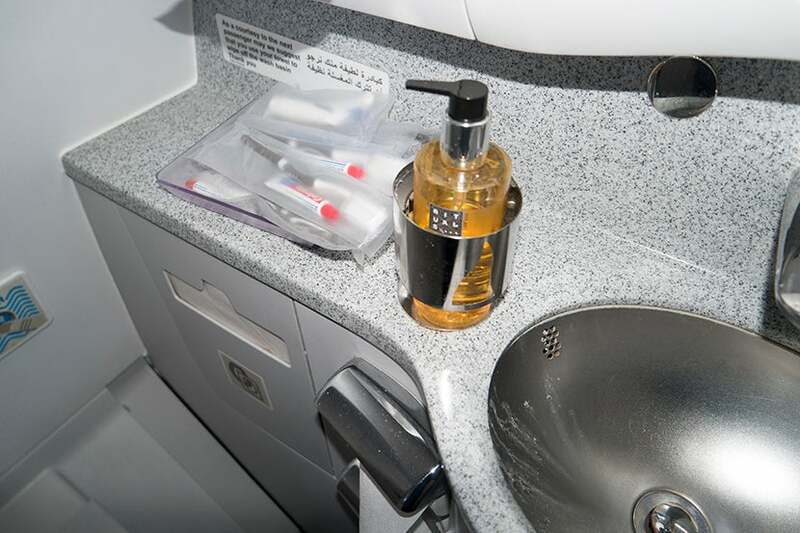 The business class lavatories were spotless and offered Rituals hand and body soap and lotion and Yin body mist, along with dental-care kits. 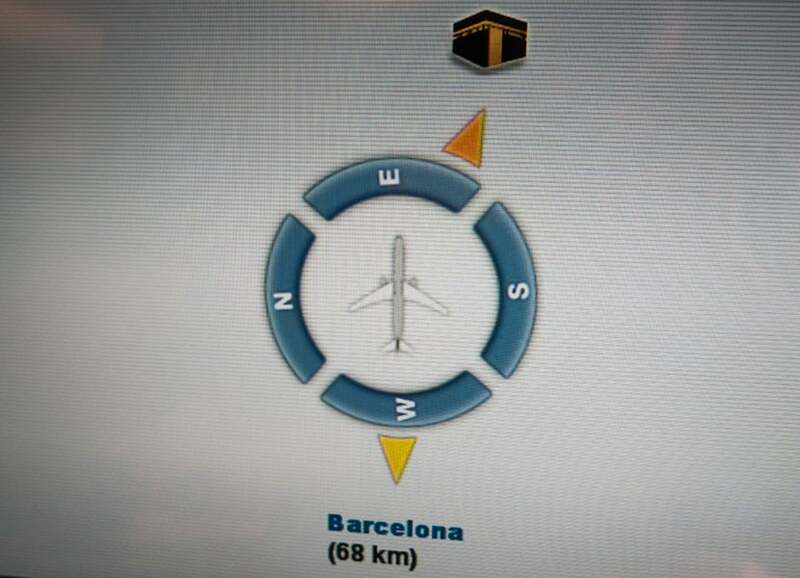 After the safety demonstration, a long and slick video displayed the many in-flight entertainment and shopping options. The film included Jennifer Lopez, Matthew McConaughey and Benedict Cumberbatch posing next to copies of Oryx under the banner “Everybody Reads Oryx Magazine,” but only McConaughey looked like he even knew the magazine was there. Lunch appetizers included a mezze, the highlight of which was a coarse-chopped baba ghanoush with sweet onions, tomatoes and red and yellow peppers — probably the best baba I’ve ever had. 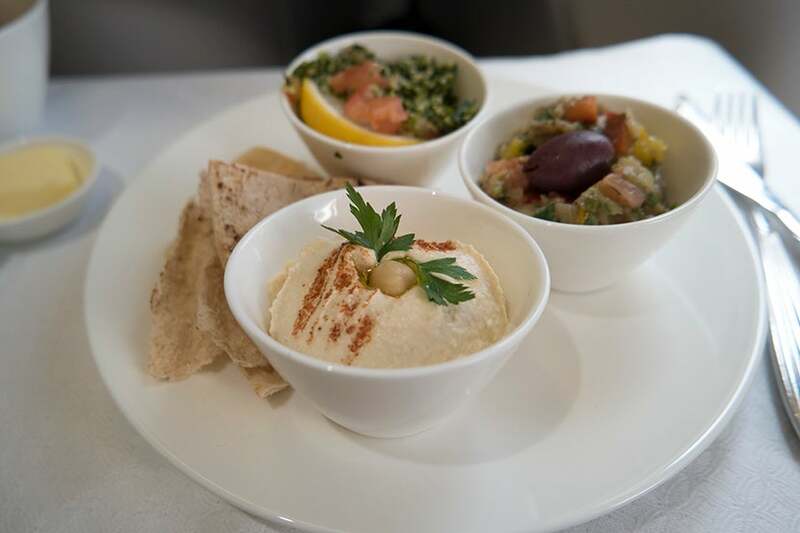 The tabouleh was quite sour, but also very fresh and crunchy, and the hummus was tasty as well. Another appetizer I enjoyed was the strongly herbed pea soup, delicious unlike any I’ve ever had. 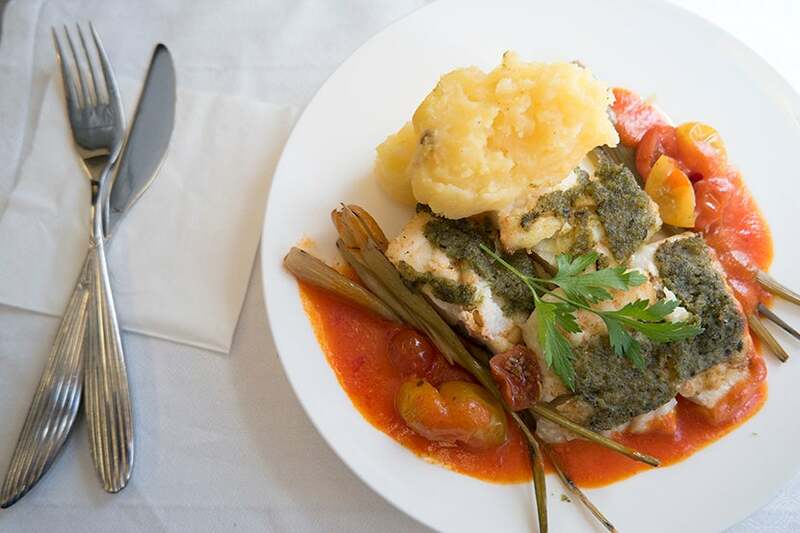 I sampled several main courses, beginning with a seared fillet of fish. The fillet was well cooked and not overdone but too salty by half. However, it was redeemed by a nice, bright roasted red pepper sauce and a garnish of fresh red and yellow cherry tomatoes. It was also served with braised fennel — served with way too much stringy stalk — and a small monument of basically unseasoned potatoes. They were called saffron mashed potatoes, though the saffron was weak to undetectable. Never mind — the potatoes were freshly cooked and cut the fish’s saltiness nicely. 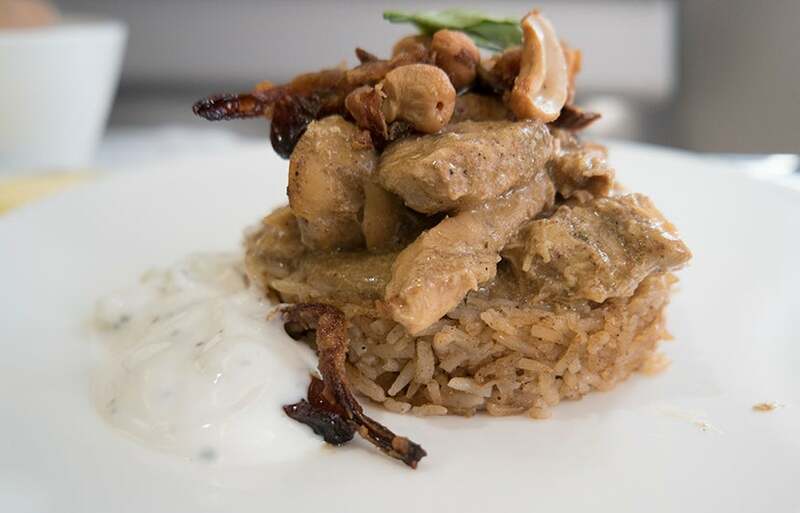 The chicken biryani was tender, and the rice wasn’t too dry. It was garnished with sultanas, raisins, cashews and sautéed onions. 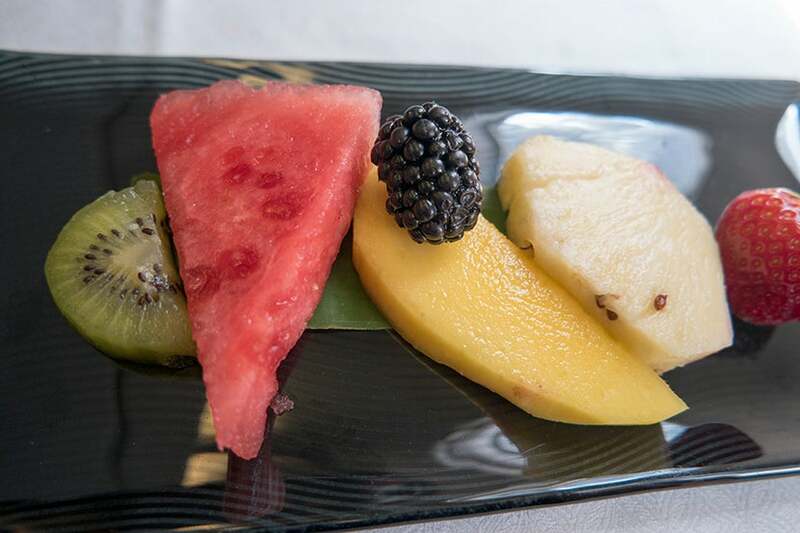 Desserts were strong too, like the fresh fruit plate and the chocolate torte with Earl Gray sauce. In addition to the Champagne, I also liked the Dr. Loosen Blue Slate 2013 Riesling, nutty and sweet. But the highlight of the beverages arrived unexpectedly when I asked for masala chai — spicy Indian-style tea with milk and sugar — and was brought a cup of utter delight. This chai was very sweet, cardamom-y and saffron-y. 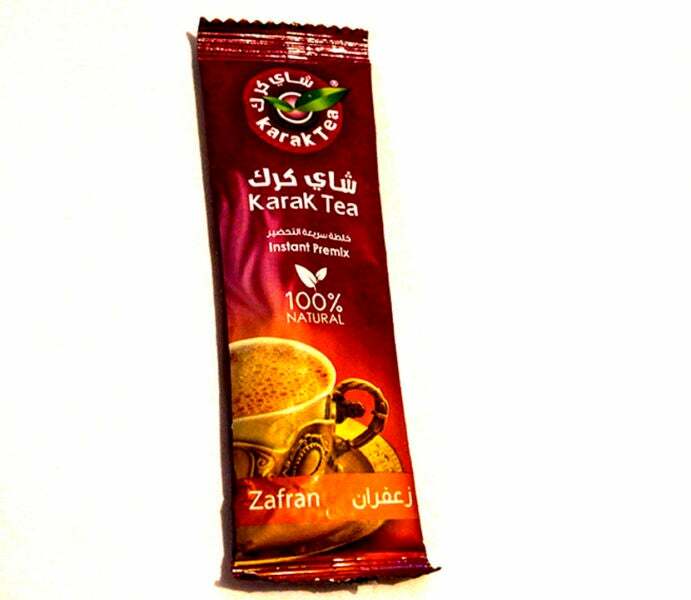 I asked our kind and attentive flight attendant about it, and instead of only telling me, she brought me a packet of Karak Tea, Zafran flavor. 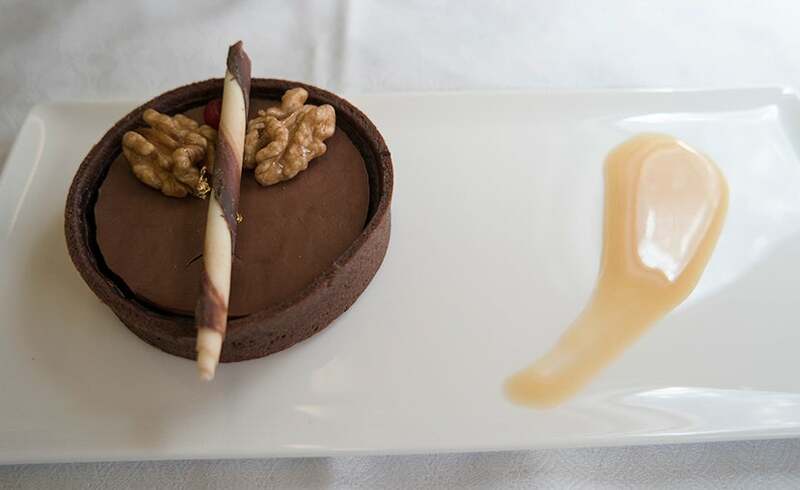 These little touches of care turned the flight into a real pleasure. Other teas were by Dilmah, an excellent Sri Lankan brand served in plastic-mesh teabags. I’ve always been partial to Vittel water over the much-better-known Evian. When I told our attendant I was happy to see Vittel on the menu, she went back and brought out a 1.5-liter bottle for me. The Giorgio Armani amenity kits included a generous tube of Acqua di Gio aftershave balm and a vial of the same cologne, as well as Rituals chapstick, and the obligatory shades, earplugs and socks. Female passengers received Armani’s Sì in both lotion and cologne. 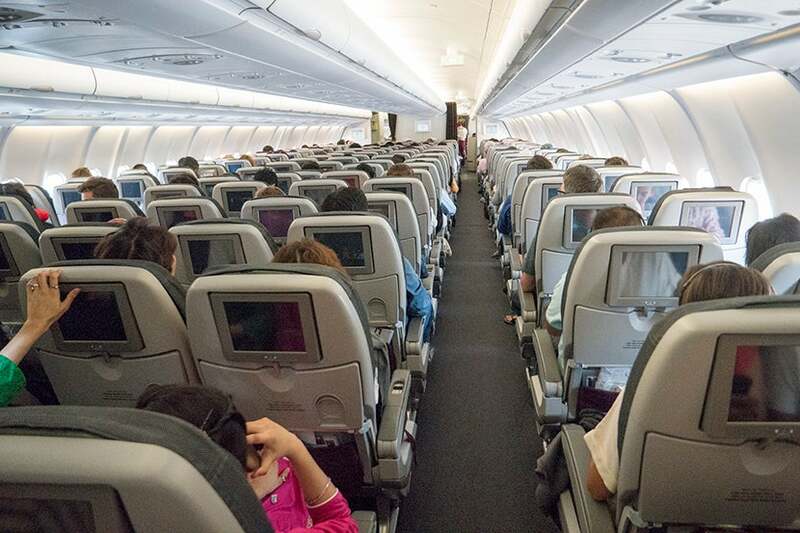 The large IFE screens are so bright they’re readable from every angle, offering a great viewing experience. However, because your screen is mounted right next to your neighbor’s — in my case, there wasn’t one — there normally wouldn’t be any real privacy. 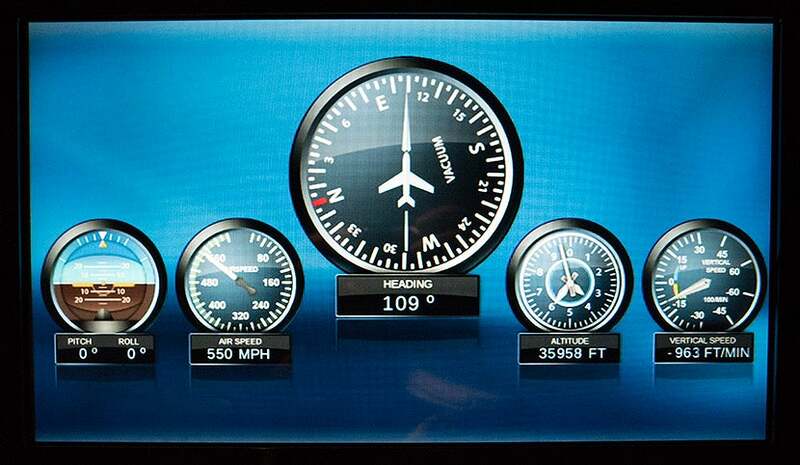 The flight data screen featured analog instruments as well as digital readings, a nice touch. There was a gargantuan selection of movies, including 50 in the “Islam & Life” category, 30 Arabic, 22 Asian, 19 Bollywood and 55 Hollywood films, with an excellent offering of classics. 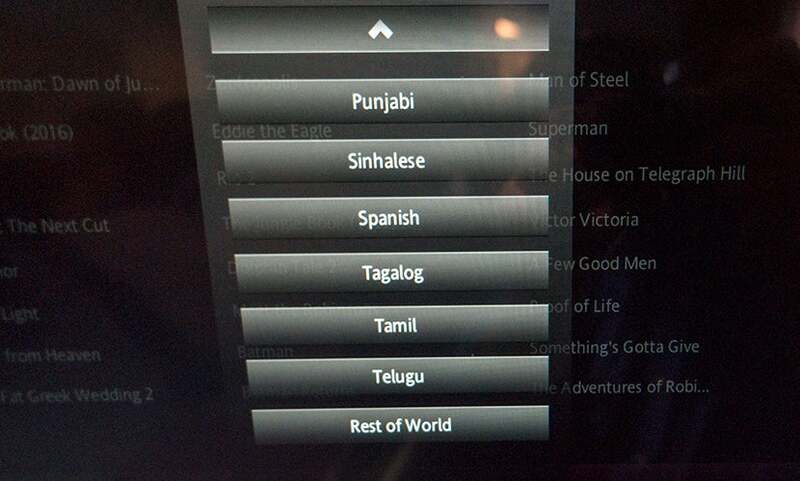 Below, just a small fraction of the many language selections. In addition, you can apparently see any of the films in an incredible variety of languages, only a few of which are shown above. Taken as a whole, these movie offerings were among the best I’ve ever seen on a flight. 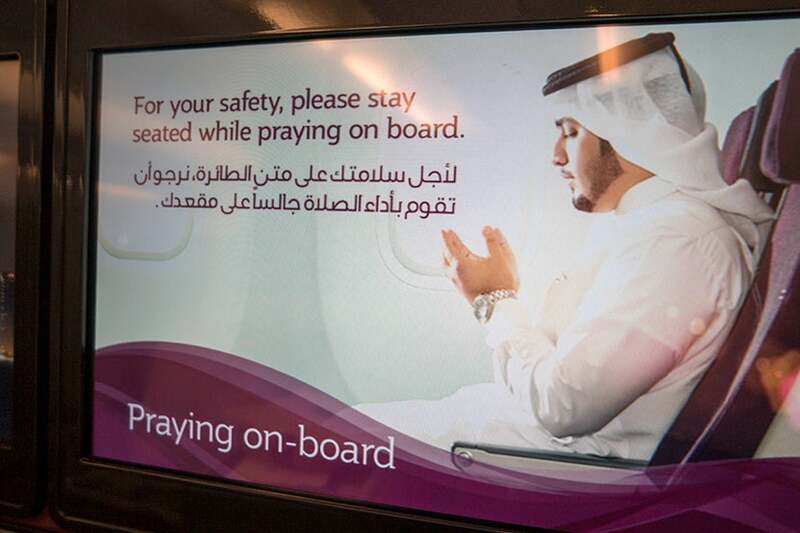 Qatar being a majority-Muslim nation, the airline supports Muslim prayer by letting flyers know appropriate air etiquette and always apprising them of the direction of Mecca. The noise-canceling headphones felt flimsy but were comfortable. Wi-Fi was not available. Just before landing, we were served a small box of Valrhona chocolates, in my opinion the best commercial brand in the world. The landing, like the chocolate, was perfect. You couldn’t feel a thing until the pilot began applying the brakes. This was hands-down one of the best flights I’ve ever been on — so nice, in fact, that I didn’t want to sleep because I didn’t want to miss any of it. Finally, I succumbed. In doing so, I found the flight’s lone weakness: the narrowness of the seat. 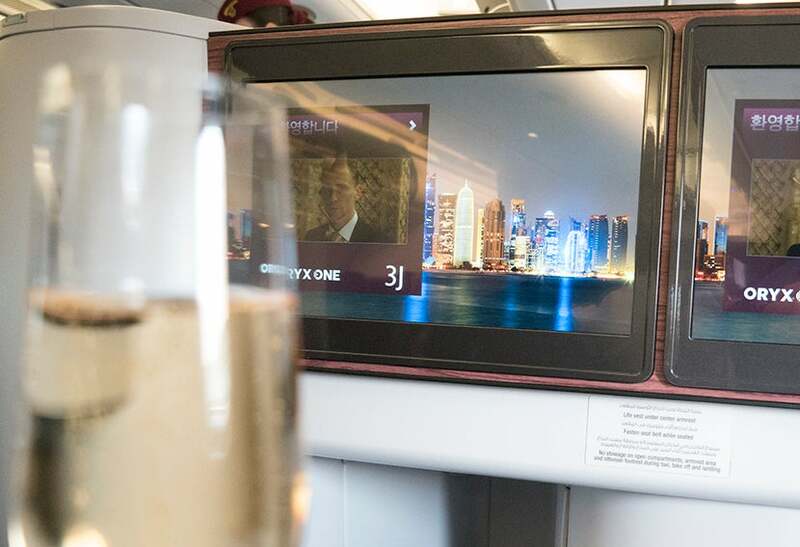 The best business classes these days are in 1-2-1 configuration and even feature enclosed suites, which Qatar itself has begun installing, albeit not on the A330s, which do not fly on the airline’s longest-range routes.